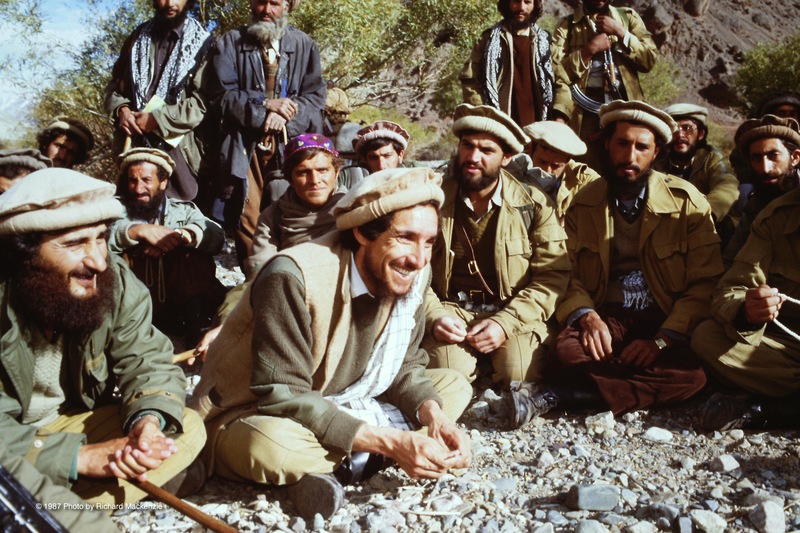 I awoke in high spirits each day after my first interview with Ahmad Shah Massoud. Everything was moving in the right direction. I had the interview I needed for my magazine profile on Massoud and, from what he said, an important battle was about to be waged. As we waited, there was much movement. 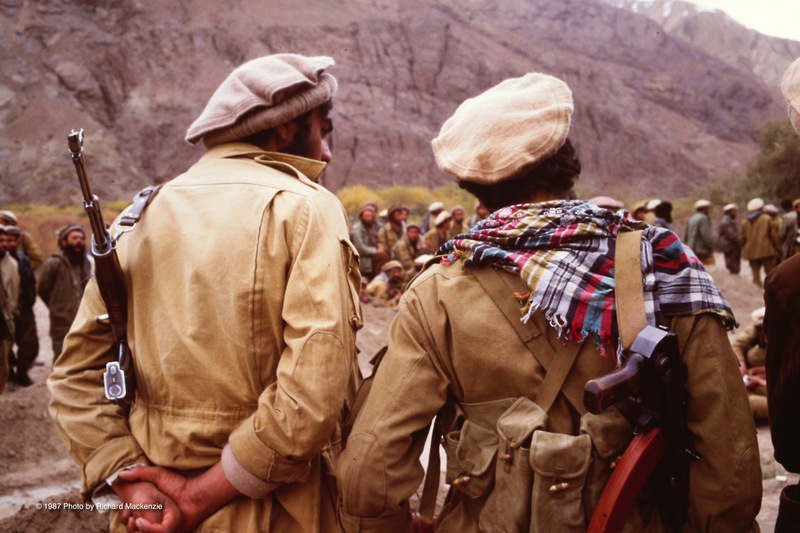 Groups of mujahideen went back and forth with determination and purpose, some of them with horses and donkeys carrying heavy weapons — rocket-propelled grenade launchers and heavy machine guns. I wait eagerly over the following days for the next move. The moment arrives and it’s time to leave, I grab my packed bag and follow lines of mujahideen down a side valley toward the Kochka River. We trek for a few hours until we reach our destination: a flat stretch of sand along the Kochka, an area known as Jengal. As hundreds of mujahideen continue to approach from different directions, we look forward in awe at what lies in front us — a massive sprawling, hand-made model of nearby Communist bases carved from sand. 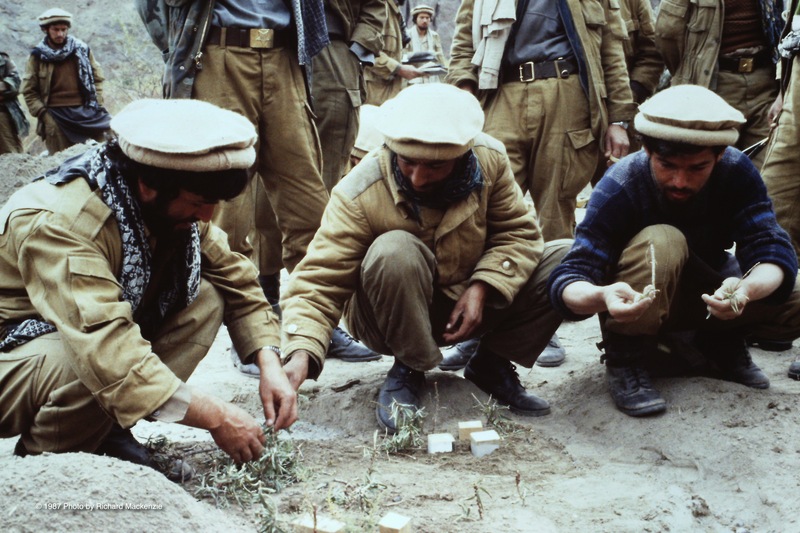 We all watch carefully as Massoud prowls the center of the huge model, meticulously checking the cascading slopes of the mountains, the width of the entrenched river bed and details of the buildings and barracks made out of match boxes, cigarette packs and slips of cardboard. Crouching down, he carefully pats the approach to one of the buildings to make sure it represents a pathway. This is south, this is east and this is west. Understand? In every operation we have some main points. I’ll tell you about the main points and then explain each one. The most important point in an operation, in the preparation for an operation, is the goal. Second is information, third is planning, fourth is enemy power, fifth is supplies, sixth direction, seventh is our power and operation. OK, now we first talk about the goal; our goal is to first capture Keran and then, Inshallah, we shall attack Minjon Valley. Understand? Then we go to information. We first want to know more about Keran because right now we don’t know much about Minjon. We can see that the area is similar to a valley, is located between two mountains, and a river has divided it in two sides. Understand? What has the river done? Divided it in two parts. Yes. On one side it is plain land, level land, and the other side is not level. I want to explain everything so you understand. What is this hill called? It is called Awi Hill. What is the valley called? It is Rager Valley. What is this valley? It is Ifsha Valley. Try to remember the names. Inshallah, you understand, do you? Now we go here. What is this valley? It’s Wawa Valley. Let’s make sure that everybody understands. This area, what is it? It’s Sakhi Valley. This small bridge which is at the top, what is it called? It is called Dara Kamar. OK? Does everybody know the name of the areas? Yes. I’ll explain it for a third time so everybody knows. Repeat after me. This is Awi, this is Rager, and this is Wawa. I told you that this side of the land is level and this side, it is not. Have I explained everything well? OK, now we will evaluate and study and see that what the enemy has. In order to understand the position of the enemy we will use the clock. Number one is the center of what? Battalion. Number two is what post? It’s Dara post. Number three is Robat. Number four is Kalata, five is Keravir, six is KhAD, seven is Dashata. Everyone should remember what number signifies what. I repeat, what’s number one, two, three, four, five, six, seven. OK. Nawab, what is your position? Four. What is yours? Two. Yours? Three. Who is three? OK. Now the enemy in here is battalion number three and this is number six. First company is in the garrison. It has three officers and thirty-seven soldiers. Second company, third company is here. Where is the second? In East, yes. So there are these forces: one is armed forces, the other is Sarandoi. The third is KhAD. Understand? OK, now armed forces, this was the first group, that the third, and which is here? Second, yes. Now in the second group there are two officers and thirty-six soldiers. In East second group, there are three officers and thirty-seven soldiers. In the post, five officers and twelve soldiers. In mortar group, two officers and ten soldiers. Number Seventy-Six Mountain Company: one officer, three soldiers. In the mountain mortar group: one officer, four soldiers. Communications: one officer, five soldiers. D’shaka: one officer, ten soldiers. Police: one officer, one soldier. Total force is one hundred seventy-five persons. Understand? How many? One hundred seventy-five. Now let’s see their heavy weapons. How many does number Seventy-Six have? Mountain mortars? D’shka? Now in East side. How many mortars? Two. OK, now you know how many armed forces are in each area and how much weaponry is with them. Here, two mortars. Here, two 76mm cannons. Here, two 72mm cannons and here two D’shka’s. Understand? Yes. They have three R-105s and one R-104 as radio equipment. Most of these weapons are, as Tora said, in the Depot. Understand? Total Sarandoi weapons is 58. First I gave you the details of the land, you know the names of the different areas. Then I told you there are three kinds of forces. Where they are and how many they are. What heavy weapons they have. Understand? Their ammunition is: mortar, 2000. 76, 1500. D’shka, 7000. And mountainous mortars, 1300. Understand? Food, they don’t have much. They have 200 bags of flour and one barrel of oil. Understand? Any questions? Now we will talk about the position of the enemy. In our operation against any garrison, if we want to find out the position of the enemy, what should we do? How do we classify the enemy? We classify them into two parts. One is the original base, the other is the protection shell. In the protection shell, what do they have? Here they have mines. This little hill here has mines. Up there, that too could have mines. Here too has some mines. According to some sources this area of Dashta has the Cluster bomb. Tora says, no it doesn’t have cluster bombs. We will see. Tora you say it doesn’t have it? Others say this whole area is mined, with the exception of the lower part. Here this hill has nothing on it. That one is mined. In here the only kind of mines are the ones dropped by the plane and no one has removed them. That area is clear. You understand, Inshallah. This was the first part of which of the enemy’s preparations? Defense, yes. Second. Where do they have a post? Here, the other? The third? The other? Understand. This is the second ring of the enemy defense. Which post is most dangerous? This, it oversees everything. This other post is not important, that one is important because it could fire on this one. Another mujahid walks forward to speak. I’ve been sharing a room with him for the past week or two, his name is Zabat. He is determined and precise in every move. A few days earlier, with Doctor Husain, he led the interviews and briefing of the Communist Army officer who came to our house to share his knowledge of the inner workings of the base they are about to attack. What Zabat has to say is important. From the vital intelligence he has gathered, he gives exact details of every room in the garrison buildings. He locates and describes the communications room, the food depot and the officers quarters. When he has finished, Massoud walks calmly back into the center of the layout and continues his lecture. I think we need to explain the position of every post once again. Remember that when we are through with the position of posts, then we talk about the manpower of the enemy force. They have these kinds of forces. How many were they? 253. We talked about light and heavy weapons. And Zabat Sahib explained the location of every post and its defense power. And he explained where and how the enemy force is located. Now we talk about our own force. 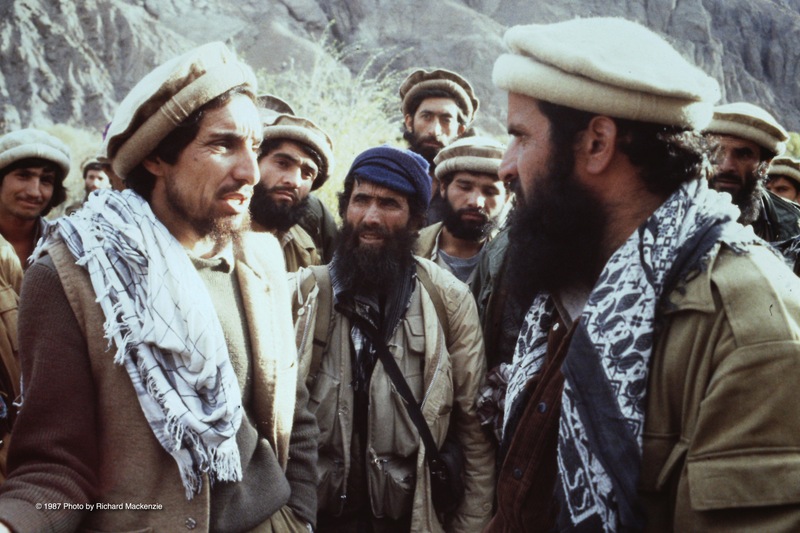 Mujahideen. The first unit of the base, the second, third, fourth units. Unit number 1 and number 2 of heavy weapons handles, of the base, the communication unit of the base, air defense, two base launches, and a health unit. 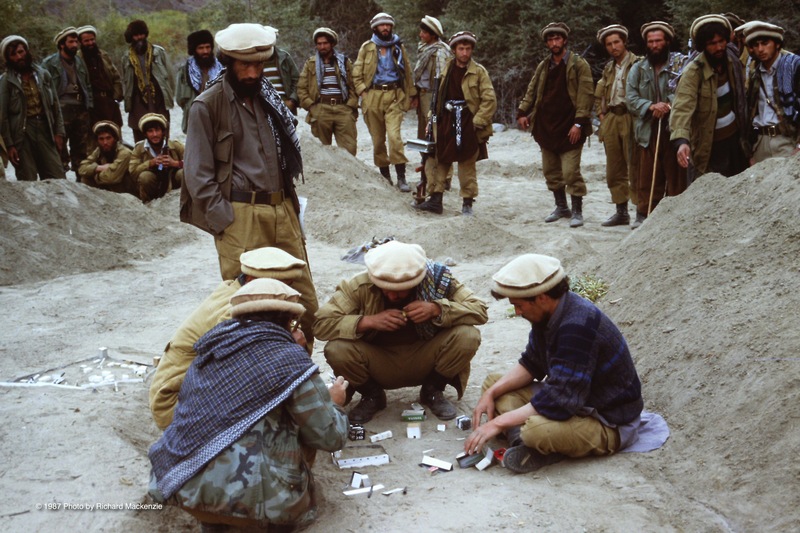 Other groups which relates to base are Kabul, Jalalabad, and Jawzjan groups. 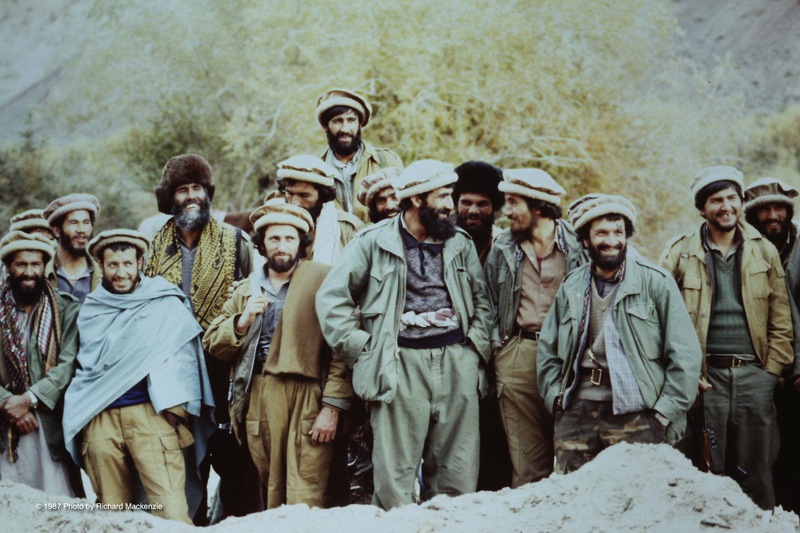 Then comes the Panjshir mobile group; Peshghur and Shaba units, each has 15 fighters, total 30; they have five heavy weapon operators so all together they are 65 persons from Panjshir and 140 from the base. Mobile of Abdul Aziz from Khost, Abdul Mamo – Khost, Parwan Gul’s group, Khelat mobile group, Farkhar mobile group, Farkhar ambush group, heavy weapon unit of Farkhar. One mobile from Anjoman. The Char Qaria group. One unit from Abdul Khaliq, one from Mahboobalua, one from Minjon which is 15 persons, and Sayad Najmuddin with 20 persons. Inshallah you understand the manpower. Total we are 530 persons. He knows every point of what every mujahid must do in the battle. He even knows — and tells them — how many rounds of ammunition each of them will be issued. Abdul Mohd, you know what you do? There are 100 mines and 10 boxes ammunition. Your duty is hitting the communication room. Understand? Yes. Is the whole thing covered? Yes. Now Sarandoi? Listen. One hits KhAD, if required. D’shka hits Sarandoi. There are two there. Over there, they should fire right here. Who operates the mortar? You know, don’t hit the river and kill the fish. Hit the Sarandoi. Everyone laughs for a moment and then the mood becomes serious again. The upcoming night will be long. 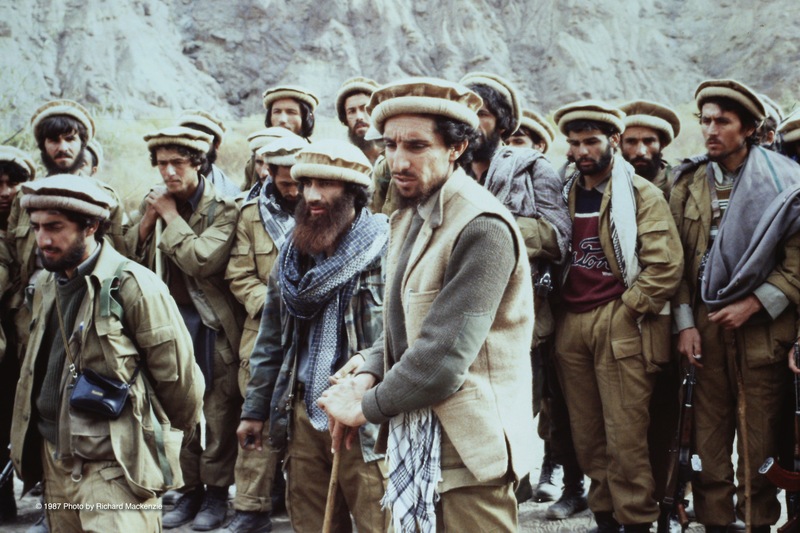 It is clear that the young men following Massoud are devoted to the cause. They are certain of their faith and they have total trust in him. But there is still much to do. And some prayers to be said. Together we walk into the evening. Prayer in the midst of Jihad. Relaxing for a moment with commanders. 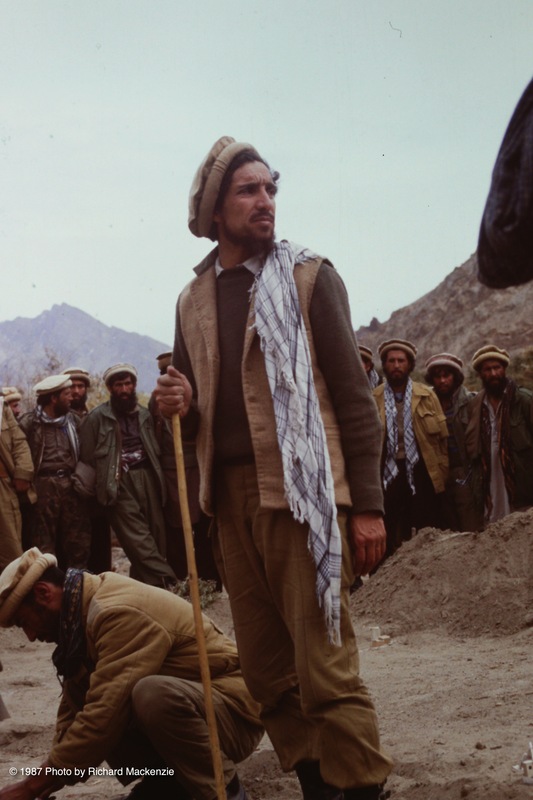 Massoud watches carefully over final details with Dr. Abdullah (left). Mujahideen building model garrison out of cardboard. 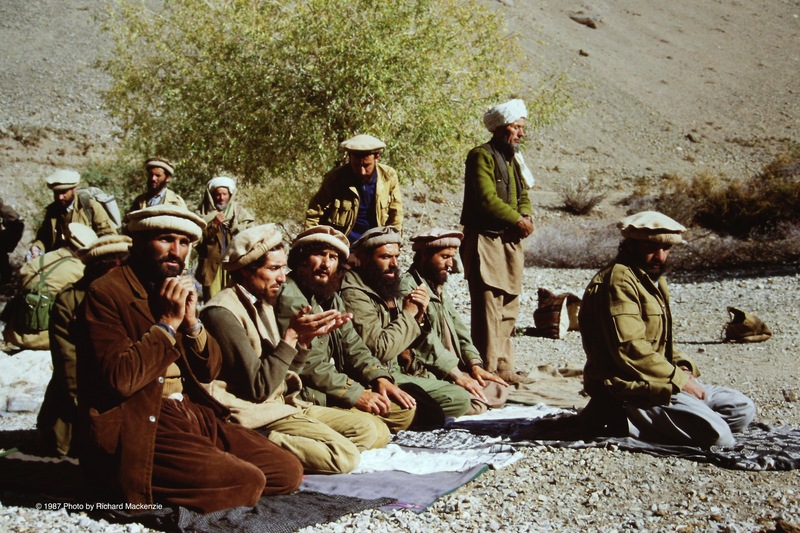 Mujahideen awaiting speech and detailed plans. Matt Gul, left. Massoud takes on a professorial role. 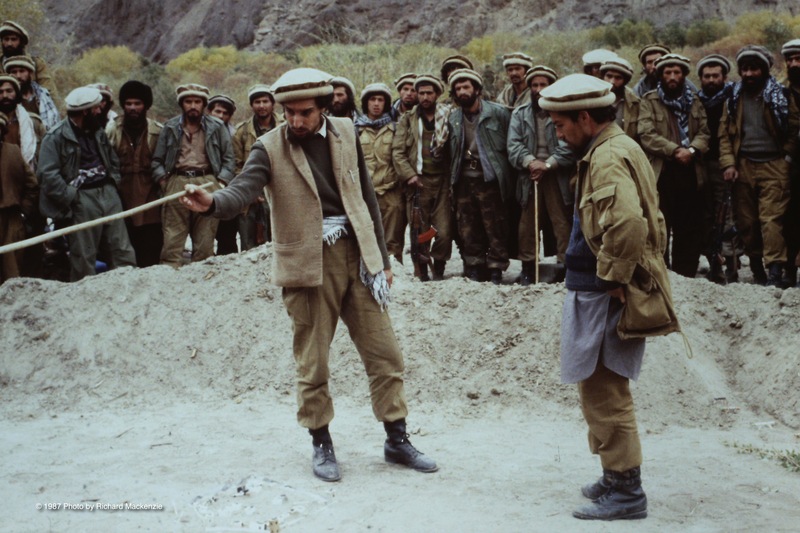 Zabat (right) joins Massoud for the briefing. A moment of humor during Massoud’s speech. they are the men of honour ! they don’t just teach us how to live our but also what to live for. Dear Mr. Richard: Thanks a lot for your nice true stories. And that would be so nice of you if you could share the videos for these photos you posted here. I am sure you have these videos, so please let us have it. Thanks a lot in advance!